A car park on campus. If you are visiting the University, you can use the pay and display parking on campus. Capacity is very limited. We recommend public transport as the best way of travelling to the University. We have designated parking for motorcycles and electric vehicles. There is no on-street parking near the University. All roads have either double-yellow lines or resident parking permit regulations. See our full list of pay and display prices. You can pay for car parking using cash at one of the parking machines, or using the JustPark app, phone line or SMS service. There is a 10p fee added when you pay using Just Park. The car parking machines no longer take card payments. The University's parking conditions and regulations apply to all visitors. Please take the time to read them before visiting the University. Blue Badge holders can park in disabled parking spaces free of charge. Read more about accessibility for people with disabilities visiting campus. You should contact the department you are planning to visit to see if they can give you a visitor permit to park on campus or in the city centre. If they can't, you will have to use the pay and display car parking and buy a ticket. 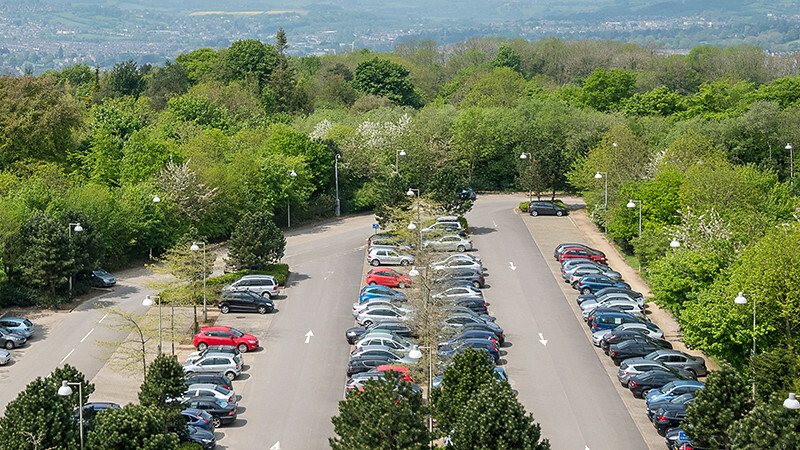 Visitor permit holders can park in the visitor spaces in the East car park, any pay and display car parks and any spaces designated for permit holders. You must not use visitor permits in reserved spaces at any time. You can only park in disabled parking spaces if you are a Blue Badge holder. You must always clearly display your permit, or ticket. If you are having trouble finding a space in the East Car Park, please use the East car park overflow. If you don't display a valid pay and display ticket, or violate the parking regulations, you may receive a parking charge notice. The charge is £60, but is reduced to £30 if you pay within 14 days. Use the coach bays in the middle of the signposted area in East Car Park to pick up and drop off passengers. Coaches must not use the bus turning circle for parking or turning as it is constantly in use. You can't park a coach anywhere on campus.